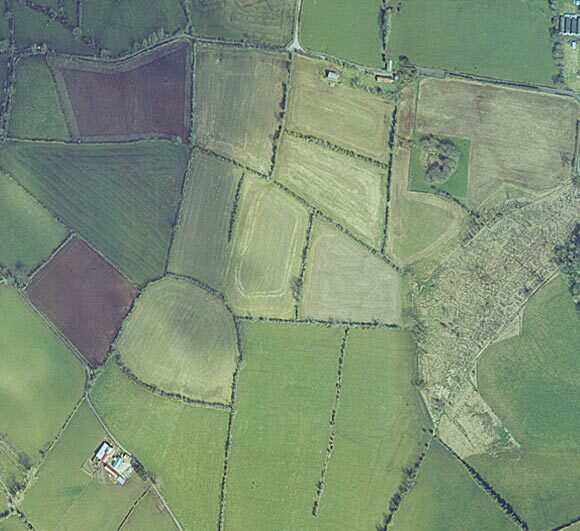 The expansion of arable agriculture continued around the Navan Fort area with minor periods of forest regeneration. The Late Bronze Age/ Early Iron Age c. 600-100 BC saw an expansion of the creation and use of grassland for grazing cattle. Towards the end of the Late Bronze Age, the water level in Loughnashade began to rise suggesting an increase in rain fall and perhaps a general deterioration in the climate. The ditch enclosing the mound at site B was found to pre-date the monument by several centuries. It is 45m in diameter, 5m wide and 1m deep and rather unusually had no internal bank. The shallow depth and narrow width of the ditch suggests it had a non-defensive, perhaps ceremonial purpose. Originally there had been a pebble-paved causeway across the shallow ditch. Archaeologists also found a series of deep pits packed with clay and stones that formed a ring concentric with the ditch but 3m inside its line. The pits were 4m apart and would have held sizeable vertical posts. There were no other traces of structures associated with these posts which suggests that they stood in isolation. The posts and the ditch have been dated to 7th Century BC and are thought be the remains of a ceremonial monument or a ditched stockade. 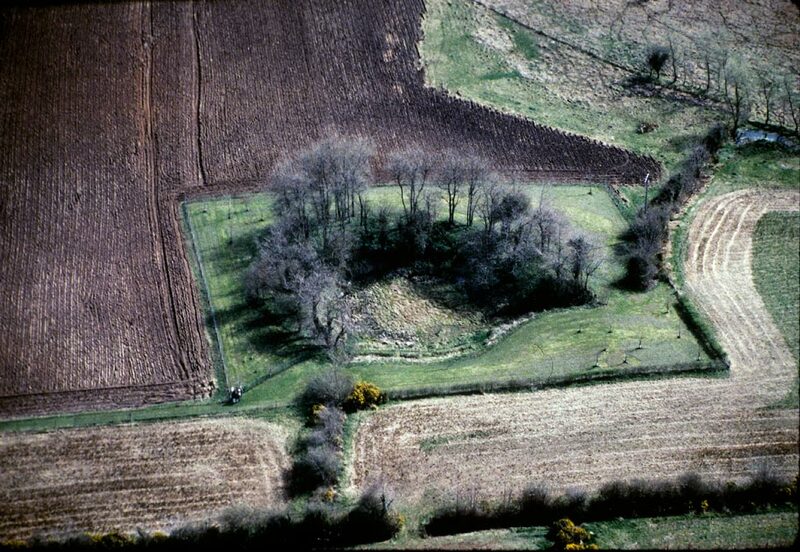 Haughey’s Fort lies to the west of Navan Fort and is thought to have been occupied by a community, which included aristocratic members, in the early part of the Late Bronze Age. The settlement consisted of a hillfort, 320 m diameter, surrounded by three concentric ditches. These ditches were 2.8m deep and 3m wide and originally excavated around 1100 – 1000BC. Evidence of post and stake holes suggest an internal stockade that would have enclosed an area of approximately 140m diameter. 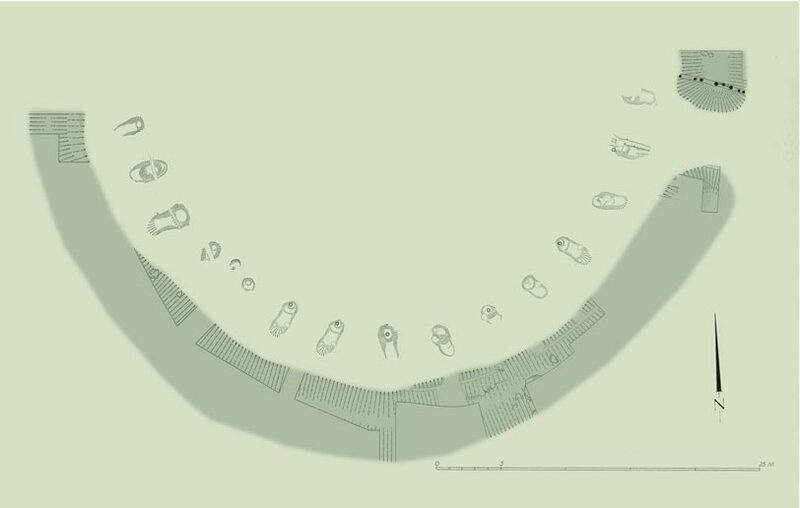 The larger inner ditch contained a series of concentric arcs of pits of various sizes which produced Late Bronze Age pottery (flat-rimmed-ware), tiny fragments of gold ornaments, seeds, and animal bones. The seeds suggest that local cereal production was dominated by barley. The bones were from a mixture of domesticated breeds; cattle, sheep, pigs, dogs and wild animals; foxes and deer. The skulls of some of the domesticated animals were unusually large; two of the dog skulls discovered are the largest from any prehistoric site. The discovery of a cup and ring marked stone suggest the site had a religious element. Similar finds have been discovered along the Atlantic coast and are thought to be mandala-like symbols (representing the universe), dating from Neolithic or Early Bronze Age. The stone may have been removed from elsewhere and reburied as a offering. Occupation of the Haughey’s Fort site coincides with the creation of the votive pool at the King’s Stables and there is evidence of an entrance aligned with the ritual site. The King’s Stables lies 1km west of Navan Fort on a slope overlooked by Haughey’s Fort. The site consists of a low embankment enclosing all except the southern side of a boggy hollow, about 25m in diameter. When the King’s Stables was excavated in 1975, it was found to consist of a regular-sided, flat-bottomed, man-made pond. This votive pool was originally excavated around 1000BC, a date which coincides with settlement at Haughey’s Fort. The artificial pond was used for sacrifice, reflecting a European-wide trend of water offerings. When archaeologists drained the pond they found fragments of clay moulds that were used for casting leaf-shaped bronze swords and some coarse pottery. A range of bones were discovered including antlers, canine skulls, a piece of human skull, cattle bones and some full animal skeletons. A number of pieces of bronze jewellery had also been desposited in the pool, and included rings and a fragment of a bracelet. Several stretches of double-ditch earthworks have been discovered running North to South in the townlands of Tray, Creeveroe and Tirearly. If the ditches were continuous they would form an earthwork 1.7km long, dividing the land between Haughey’s Fort and Navan Fort. The linear v-shaped ditches, 7.2 m apart, at Creeveroe contained animal-bones and flat-rimmed-ware that date the construction to the Late Bronze Age. This entry was posted in Archaeology, history, Research and tagged archaeology, artefacts, bronze age by digkeyltd. Bookmark the permalink.